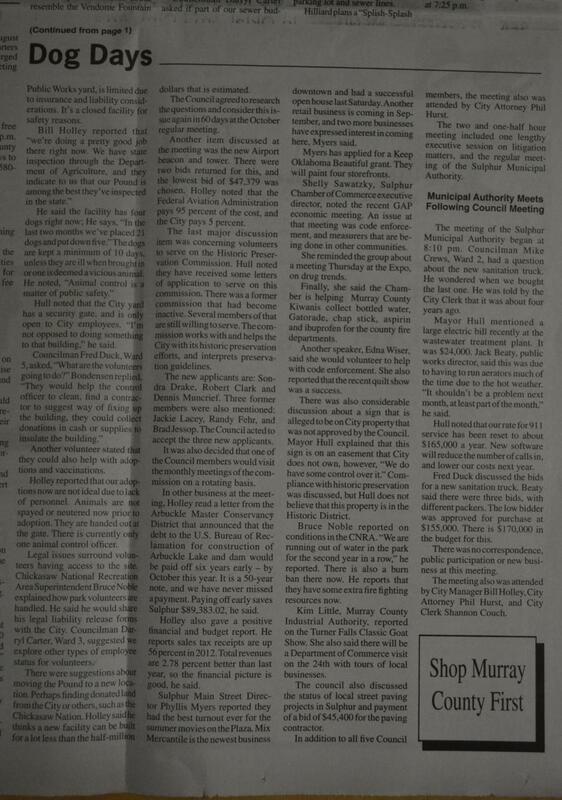 July 2012 the City of Sulphur decided to make some drastic changes in the way they manage their animal "Shelter".... they began refusing help from local volunteers even refusing to use fans and kuranda beds donated to the shelter. Volunteers are no longer allowed to go to the shelter to photo the animals for posting on Petfinder, Facebook and other social media in hopes of adopting the animals out before they are euthanized. The Shelter is also not allowing the general public access to the dogs and citizens living within Sulphur City limits are no longer allowed to adopt animals from the shelter...... the reason given was that the people of Sulphur adopt animals and then after a week dump them and they end up being picked up again by animal control. (This is interesting since we have only had 6 animals go to the pound more than once within the last year and a half). Of course the numbers from June - July are not included in this. We began a facebook page (www.facebook.com/justiceokanimals) to reach out to the public to help the animals of Sulphur and are happy to say that we have received alot of interest and many voices for the animals. We are told (but cannot confirm) that the shelter is now using an industrial fan for the dogs which is awesome! AUGUST... already. 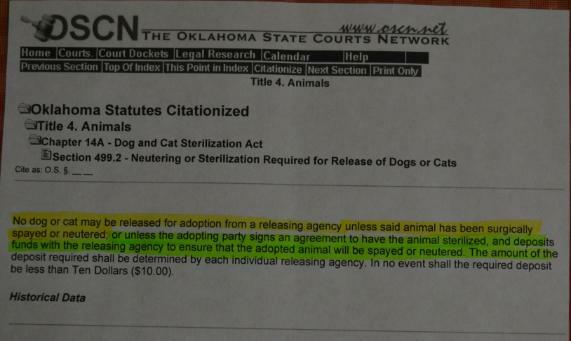 Another change in effect, the Sulphur City Manager, Bill Holley, who used to not allow anyone to refer to the shelter as a pound (because he thinks of it as a "dirty word") is now stating that it is in fact a pound, not a shelter..... they are still not allowing the public access to the "pound" and site that volunteering is not feesible with the current location (behind the city gate to the public works area with mutliple safety issue).... a wonderful volunteer brought up two facts that make that make this even more confusing...... where is the Sulphur tornado shelter located? and where does the public go to dump their excess trash freely on Fridays after paying the $10 fee? ...... ah, BEHIND the city gate where the "pound" is also located. It is interesting to say the least and I will (for now) leave it at that and let you ponder it for yourselves....... 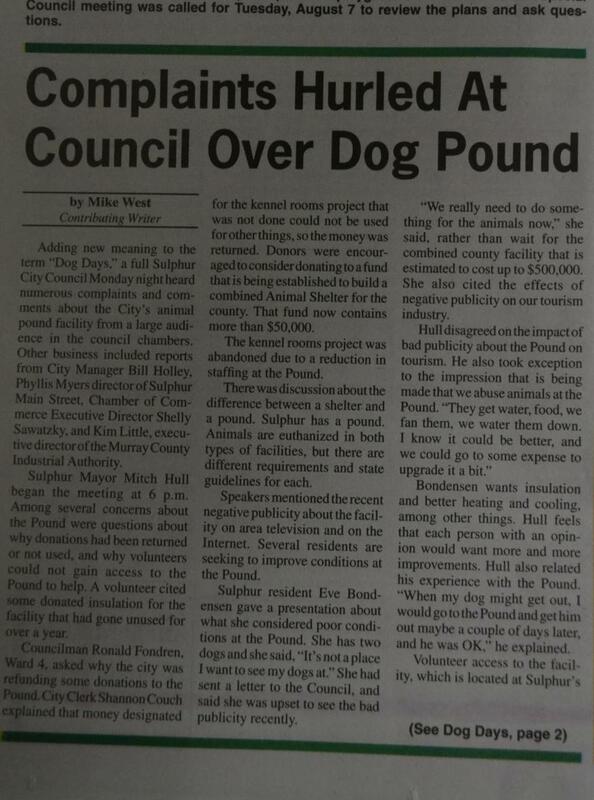 Please see below, the current issue of the Sulphur Times (August 16, 2012) referring to the City Council meeting held on August 13th..... we would appreciate anyone who is able to attend these monthly meetings with us to do so but ESPECIALLY the OCTOBER MEETING where the pound issues will be readdressed.... there are only 48 chairs in the meeting room- we can fill those chairs surely...... I will post time and date of this VERY IMPORTANT meeting soon as well as location and hope to see you there!